Super CUTE idea for a Birthday Party! 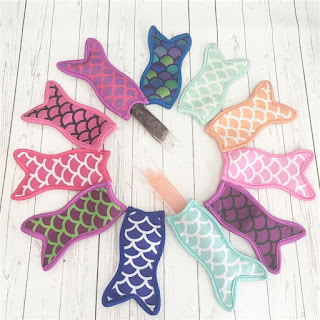 Mermaid Popsicle Holders $2.99 (Retail $5.99)! No more paper towels! Keep those little hands from freezing this summer with these adorable mermaid shaped popsicle holders. Each holder is made from neoprene and will fit most regular sized popsicles. 11 different color choices - please see pictures for color choice numbers. $2.90 for the first item and $0.10 for each additional item. US only. Seller usually ships within 3 business days. Ships no later than Sat, May 5.